One more chance to get a signed copy of The Gathering Storm, volume 12 of Robert Jordan's The Wheel of Time! 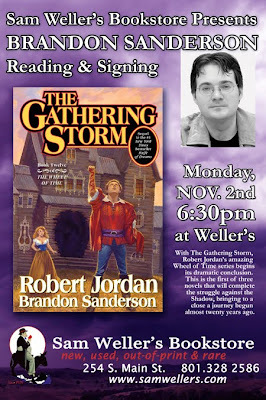 Brandon Sanderson will be at Sam Weller's Bookstore to read and sign on Monday, November 2nd, at 6:30 PM. Brandon won't be back in Utah at a signing until mid-December, so this is your last chance for a while! I've been reading The Wheel of Time since I was 14 years old (1992). I've eagerly awaited every new volume and devoured them as quickly as possible, so I could barely wait until I got home to read The Gathering Storm after I picked mine up on Tuesday, and I'm about halfway through. I'm so thoroughly excited I can hardly stand to be at work rather than curled up in a comfy chair at home. It's the beginning of the conclusion, and I know that you will love it, too, but you don't have to take my word for it. I spent last weekend surrounded by books and memories. It was a lovely feeling, a bit bittersweet at times, but lovely nevertheless. First up were the activities associated with the Utah Humanities Book Festival For us, the preparation starts months beforehand, when the booksellers who will vend at the event get together for the Author Lottery. It's a gathering akin to a sports league draft except that I actually care about it. Each bookseller arrives with a list of the authors she'd most like to sell at the event. Then we take turns choosing authors until every author who'll be joining the Festival has a store to sell his or her books. It's thirty to forty minutes of what probably seems mundane to many, but to us it's exciting. What happens during that time sets the stage for the Book Festival to come. The Festival itself was enjoyable as always. What bookseller can rightly complain about being surrounded by books, their authors, and the people who love them? I so enjoy standing at our booth in the Urban Room of the Salt Lake City Public Library and talking with the passersby. I did disappoint one man who responded to my, "Let me know if you have any questions," with an actual question, "Is there a God?" I think my answer disappointed him. But the book related conversations I had were delightful, scintillating, heartening. It makes me happy when people tell me how much books mean to them; how their lives are richer; how much they've learned; how they laughed and cried. And it makes me just as happy to listen to Festival goers talking with the writers they know and love, and the ones they've just discovered. And there was a lot to love: from the immensely talented local favorites Sara Zarr and Shannon Hale to East Coast writers Dylan Landis, Jed Perl, and Edwin Torres. It does a bookseller's heart good. This year the Book Festival concluded on Sunday with a presentation by Selected Shorts. Yes, they do leave Symphony Space once in awhile. Isaiah Sheffer and two of his talented actors read some pretty bleak Utah related stories to an auditorium of eager listeners. There was also a sing-along quiz during intermission. Envision, if you will an auditorium filled with a variety of voices singing, "Don't fence me in," after Mr. Sheffer sang, "Oh give me a land, lots of land, under starry skies above," and you get the idea. Actually, that was our best song. The responses to his other first lines were much weaker. We didn't know as much of the great american songbook as I thought we would. Oh the shame! While the stories were recorded for broadcast at a later date, I doubt the sing-along was — and you should all be grateful for that. Sitting in that auditorium for the first time since I attended Sam's memorial service there was the bittersweet experience to which I referred. Tony used to call Sam and Lila on Sundays to tell them to listen to Selected Shorts. Sam would run the tuner up and down the dial and pronounce that he couldn't find it. Their radio didn't "get FM." But Sam loved radio. And he loved the writings of his friend Wallace Stegner. When the actors read two Stegner stories I couldn't help reflecting on how much he would have enjoyed being there. He would have emoted loudly, possibly at awkward moments, and provided a running commentary that would've driven the engineer recording the event wild. He would have embarrassed me. And he would've loved every minute of it. Each year of the Utah Humanities Book Festival has a different mojo. While this one was a bit quieter than Festivals in the boom years, it was no less enjoyable. I found great books and made great some great memories. And as I walked out the doors on Sunday afternoon, I was already looking forward to next year's authors lottery. Last March we announced our intention to downsize and move from our Main Street location. Loyal customers and old time Salt Lakers flocked to our store to share their memories, give us their good wishes, and take advantage of our moving sale. All of those actions helped us. The good wishes and the love were invaluable during a time when we felt beleaguered. The stories were heart warming and fascinating. We were so moved by your stories that we created the Moving Histories Project to document them. Many of the videos we shot are on our YouTube channel now. And what about that sale? Well the sale was designed to begin to reduce stock and, most importantly, help us downsize in place while we put our building on the market and searched for a new one. And you, dear customers, have helped us achieve that goal. Thank you. So now we move on to another phase of preparations for our relocation: reducing the Bargain Rooms. Those who frequent us physically (instead of virtually) have watched our Bargain Book area grow from one room to two rooms and now three rooms. The books in there aren't junk, they wouldn't be on any of our shelves if they were, but they're not the right stock for our regular shelves. 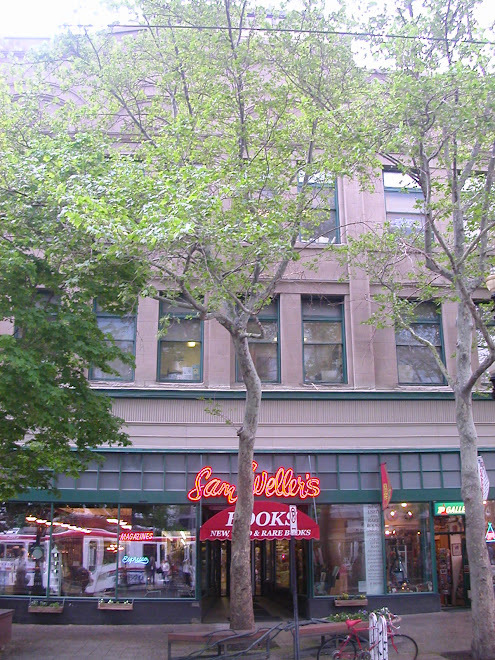 As they've moved from their former sections, each of the books was marked to $1.00, $3.00 or $5.00. And now they're even cheaper. We need to move those books out so we can move on. So if you buy 10 or more books from the Bargain Room, you'll get 50% off the lot of them. Of course you want to know about our move. There's only so much we can say at this point. We're in negotiations with a buyer for our property. We've identified 3 properties that we think look good. Tony and the management team are covering details about reading and stocking philosophies, aesthetics, businesses to potentially partner with, you name it. It's a lot of planning, and it's exhilarating. In the mean time, we're still here for you. We're stocked with wonderful new and used books and we're dying to show them to you. This is one of the best new book publishing seasons we've seen in a long time. We'd love to share our books and their stories with you. 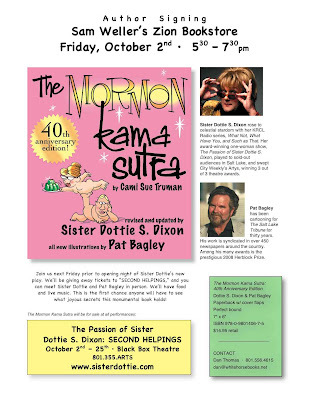 We're just tickled pink that the one and only Sister Dottie S. Dixon will be stopping by the store tonight to celebrate the publication of her new book, Mormon Kama Sutra. Joining her will be collaborator and provocateur Pat Bagley. It's the 40th Anniversary Edition, you know, and it's hot off the presses. The books at our party will be straight from the bindery. They're $14.95 paperbacks and worth every penny. It's never too late, or too early you newlyweds, to add spice to your life. For those of you who don't know Sister Dottie yet, check out this link http://www.sisterdottie.com/ and prepare to laugh. She can also be heard on KRCL FM 90.9 every Friday at 3:00 p.m. and Saturdays at 10:00 a.m.
Of course you all know Pat Bagley from his editorial cartoons in the Salt Lake Tribune and his Clueless George books. Pat's also the publisher of White Horse Press, a fine local business that we're always happy to support. So come on down to the store between 5:30 and 7:30 p.m. tonight (Friday Oct 2) and say "Hey!" to Sister Dottie and Pat, especially if you're going to the opening of The Passion of Sister Dottie S. Dixon: Second Helpings at the Rose WagnerTheater. You'll double your fun. On Monday a young man approached me with one of those bookseller's dream questions. No, he didn't want to buy all of our unsaleable stock, though that would have been nice. He came in on behalf of a friend who wanted to propose to his girlfriend in our store. She's a customer who loves us. He's a creative guy who loves his girlfriend. And, Brendan, his friend, was a willing and capable organizer. The idea was that Brandon (confusing isn't it? They really are 2 different people), the hopeful boyfriend, would take Abby, the unsuspecting girlfriend, out to dinner. After dining, Brandon would suggest they go somewhere for desert and walk Abby down the street to our store. When they reached our store, Brandon would suggest they go in to browse. Abby would protest, knowing we were closed. Brandon would say, "Let's just see," open the door, and walk her inside our deserted store to find cheesecake and drinks awaiting. Then, they'd retire to the rear of the store to sit in an environment created for the purpose, watch a video, and Brandon would propose. How could I say no to that? So last night Brendan and two friends began loading equipment into our store at around 6:00 p.m. A table, couch, video equipment, Christmas lights and electric paper lanterns were hauled in through the back doors. Lights were strung, video was set up, desert stashed. It took two and a half hours in all, and when they were done it looked so very romantic. I killed the store lights and we waited. About 5 minutes before they arrived, we received a call that the couple was on their way. I unlocked the front door and hid under the cashier desk. Brendan and the boys hid on the balcony. And then a couple walked through the door, a different couple. Since I couldn't see them and didn't know what Brandon and Abby looked like, I was clueless. So Brendon shouted out that we were closed. As the confused couple left, Brandon and Abby approached. The other couple told them we were closed but Brandon and Abby persevered. After they got through the door and picked up their desert, I snuck around the counter, locked the door, went to my desk in the back rooms, and pretended I wasn't here. Waiting was agony. I was jittery and my stomach hurt. When they left, we got an all clear signal. None of us ever showed our faces while Brandon and Abby were in the store. It was their private moment. I am happy to report Abby said, "Yes!" to Brandon's proposal. I watched the video while the boys tore down. It was dreamy: thoughtful, loving, romantic, hopeful. The whole set up was a fitting start to one of the ultimate acts of hope these days, the public declaration of love and an intention to forsake all others for that relationship. We at WellerWorld were delighted to watch love bloom in our store yet again. It's always an honor to share moments like this with customers, one of the many things that makes bookselling rewarding. People get to know us and they include us in parts of their lives: relationships, proposals, weddings, births, funerals. And we are privileged in that inclusion. Thank you and good luck to Brandon and Abby.